The number of teen smokers in Arizona is dropping. In fact, Arizona has seen the largest drop of any state in the country. KJZZ’s Al Macias reports.AL MACIAS: The rate of teen smokers is down 11 percent over the last two years, according to the Arizona Department of Health Services. The Arizona Department of Transportation is emphasizing driver education as it prepares to launch a ‘Dust Storm Awareness’ campaign. Blowing dust is quite often a main weather feature in the desert during the summer monsoon. New figures show that fewer Arizona teens are using tobacco. While the overall use of tobacco is down, the use of smokeless tobacco is still a concern. Victor DeNoble was once a researcher for a major tobacco company. The Maricopa County Attorney’s Office wants to be able to better investigate strangulation attempts. It’s getting ready to roll out a program throughout the county to make it easier for investigators to collect evidence in those cases. The Glendale City Council is expected to vote Friday on an agreement with the potential new owner of the Phoenix Coyotes. Under the deal, the city would pay Greg Jamison more than $300 million over 20 years to improve and manage Jobing. The Arizona Legislature has sued the Independent Redistricting Commission. The federal suit asks the court to give the job of redrawing Congressional districts every ten years back to state lawmakers. From Phoenix, KJZZ's Mark Brodie reports. The federal government is putting pressure on states across the county to end what they call an epidemic on the roads. The U.S. Department of Transportation released a 'Blueprint for Distracted Driving' on Thursday. ALL-NEW SERIES BEGINNING JUNE 18 ON KJZZ 91.5Mexico faces a critical presidential election in July that could affect billions of dollars of cross-border trade and strategies to combat drug cartel violence. Arizona Attorney General Tom Horne is giving more than $400,000 to the Mohave County Sheriff’s Office to pay for patrols in Colorado City. He says it's needed because the town’s police department is effectively controlled by the Fundamentalist Church of Jesus Christ of Latter Day Saints. The federal government is feeling pressure from animal activists and Congressman Raul Grijalva over its wild burro roundup in Southern Arizona. A wild burro north of Artillery Peak in Alamo Herd Management Area of Arizona. The Obama administration has been pushing Congress to extend low-priced loans for college students, beyond the end of this month. Without intervention from Congress, the rate will double on July 1. KJZZ's Dennis Lambert discussed the cost of a college education with U.
Tom Chauncey II talks about friend of the family Walter Cronkite. He discusses Cronkite’s influence on journalism and Arizona State University. Chauncey says there was frustration in the industry with journalism schools. Dr. Pamela Rutledge, director of the Media Psychology Research Center, explains the role of social media in society, news, and relationships. Rutledge says her aim is to use the lens of psychology to look at aspects of media and media technology to understand the impact on people as producers and consumers. Former Maricopa County Attorney Andrew Thomas talks about the government corruption he says led to his disbarment and why he thinks Arizona needs Proposition 115. Thomas says Prop 115 will make the judiciary more accountable to the people, but it’s not a cure-all for the system or the government. The Friends of Public Radio Arizona added three new board members to its team last month: John McDonald, vice president, Corporate Communications for US Airways; Julie Johnson, executive vice president of GPE Commercial Advisors; and Adam Isaacs, director of communications and sustainability for Sun Orchard. A second U.S. Supreme Court justice has denied a request by the town of Tombstone to use heavy equipment to restore its water system.This is the second time Tombstone has requested an emergency injunction – and the second time it's been denied. Freshly painted, eye-catching colors that evoke energy and creativity coat the walls of KJZZ’s SPOT 127 Youth Media Center, which is under construction in preparation for the launch of two summer sessions and an after-school program. Northern ExposureKJZZ’s long-time host, reporter and friend Terry Ward is gearing up for a new adventure in broadcasting. After 26 years with KJZZ, he’s heading north to serve as KNAU’s All Things Considered host. District 9 ForumsThe race for Arizona’s new 9th Congressional District is one of the most competitive in the state. KJZZ is hosting community forums so you can hear what Democratic and Republican candidates have to say about the issues that matter to you, and ask them about what’s on your mind. 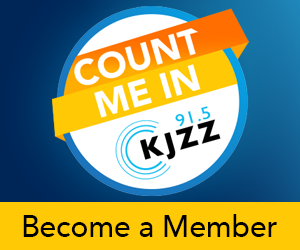 Thanks to you, KJZZ has been leading the way as one of the top radio stations in the Valley and one of the top 10 public radio stations in the country-- and you’re the number one reason for that success.